Discussion in 'iPhone and iPad Games' started by Jayenkai, Jun 22, 2015. You join us as the geeneric looking 8-bit orange ball leaps, once more, over the maze of Spikes ahead of it. Your job, as always, is to guide the constantly bouncing orb past all the Spikes, without touching any of them. There is only one control : Touch to Move. There is only one rule : Spike.. DISLIKE!! If you've played the original SpikeDislike game, you'll probably remember the Challenge mode that was somewhat neglected. I started to add Challenge mode, but very quickly ran out of ideas. When SpikeDislike2 came along, Challenge mode was all but forgotten, as I took the time playing with different mechanics for all the different themes. This time around, I've gone back to Challenge mode, and rather than just having a menu of themes, I'm wrapping everything into a "Level" structure. Each theme now has 10 levels, ranging from the simple generic "Get past X spikes" through to "Score EXACTLY X points", "Beat the Sheep", "Bounce less than X times" and more. Each level also has a "Fail" counter. If you fail a level 3 times, you may continue on to the next level. But be sure to come back later, to clear up those failed levels! Every tenth level is, of course, a classic-style "Infinity" level, which has your usual GameCenter scoreboard, and plays exactly how you expect SpikeDislike to play.. 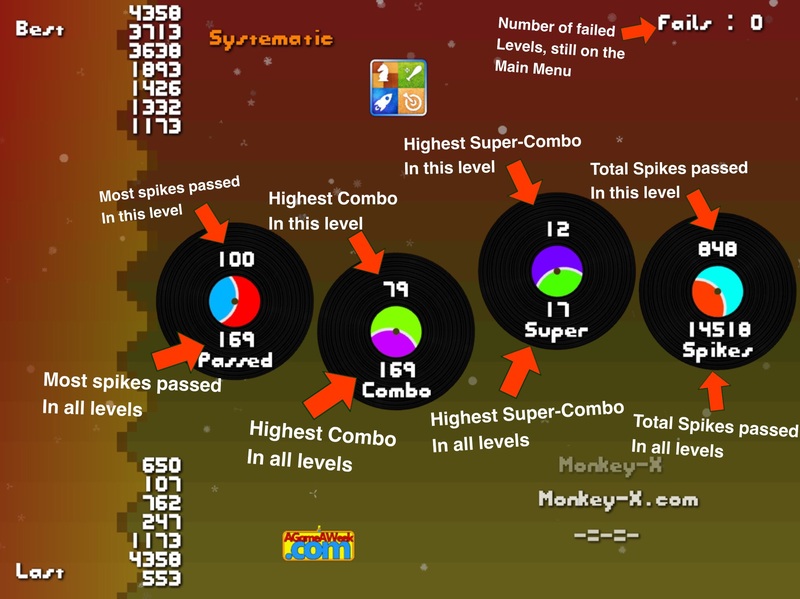 There are 15 themes in this first release of SpikeDislike3, which means there's 150 levels to make your way through. The levels range from incredibly easy, to insanely taxing, but hopefully the "3 fails = unlock" mechanic will be enough to keep you playing. In addition, you'll find things are a lot smoother, the graphics are "enhanced" (without being .. .. Better!) and I've also added a proper soundtrack, too, which is a first for SpikeDislike. All in all, IMO, this is the absolute pinnacle of SpikeDislike. This is as "nice" as it gets, and everything feels like it oughta. There is, of course, more I can (and will) be adding to the game, but those can wait until another time. 15 themes is a tiny number, (Although SpikeDislike2 only had 20!) and I'll be adding to that over the coming months. Suffice to say, this is only the beginning, and there's much more to come. I hope you enjoy SpikeDislike3 as much as I've enjoyed making it. It's different enough, with new graphics and music, a slightly tweaked physics engine, a much less forgiving Combo timer, and none of those silly "lives" this time around.. There should be plenty of stuff that old fans will enjoy. It's also cleaner and simpler, so those who are new to the world of SpikeDislike will be able to actually use the menu without needing an instruction manual! If you have any comments/suggestions/ideas/gripes/anything else, feel free to pop them below. downloaded ready for the morning. Looking forward to this. Best of luck. Hope you enjoy it. Looking forward to your opinion. I don't see it available for download yet in the US appstore, but the link in the post is to the US appstore. Any thoughts? It'll probably take a couple of hours to filter through. You know what the AppStore's like! Sorry, I probably should've waited a few hours before posting this, but the game's been stuck in review since June 3rd, and I wasn't waiting any longer!!! Finally! 10 levels in and Im hooked again. Support awesome dev and get this liek nao. Lemmie know if you like/dislike!! fantastic game done the first 20 something levels so far. same old spike dislike but improved well worth picking up. keep up the great work making games. Glad you're all enjoying the ride, so far. I've had a couple of suggestions for tweaks, already and am currently attempting to get those to work nicely. I'm also adding in the first batch of new themes. All will, of course, be supplied via a single update, and no horrible IAPs or other such nastiness! Eeeuw!!! I would love a way to replay the level quickly once I die. Maybe some sort of auto replay option in the settings? Wow, you're the third person to now suggest that!! I'm already working on it. Personally I find the "to the menu and back" to be incredibly fast and easy to repeat. (3 seconds at the most!!) I honestly cannot imagine that having a great big "retry" button will make that ANY quicker.. But I can't argue with the masses. I'm going to be adding it in as an option. Another suggested tweak is "loop the music". Looping MP3s is horrific, and I hate any game that attempts to mask the nasty noticeable join between loops. I'll probably add a simple "and then the music starts again" sort of loop, but .. Euuw.. Still not a fan! Another entry into the options menu, methinks. If you tap either of the right hand corners (the black circles) the scoreboard shows up. This is what is all means. Have 1 and 2 now time to get 3. I've already added one new theme, and am hoping to up that count to 5 new themes.. Whether I can do that remains to be seen, but that's the target. Given that fact, it might be a couple of weeks or so before I'm ready to upload this next release to Apple. But rest assured, it is indeed on it's way! Fantastic!!!! Have you thought of a psychedelic trippy theme? There's a LOT of themes that I want to attempt. I'm not sure I can pull all of them off, but it'll be fun to try out some new effects and things. A whole triply psychedelia thing might be tricky, given that I'd have to layer the gameplay over a constantly redrawing background. (Getting marginally techy here!) It kinda works on the Eighties theme, but that's only because it's solid blocks of colour. A properly triply theme would need more colour, and with the new Portrait mode, that's a lot of drawing to keep up with. I'll give it a go, though. Might as well!! There's also some old themes that I really oughta revisit. The basketball theme in particular, is noticeably missing from this edition. I kept meaning to get around to it, but never did!! So, yeah, lots of ideas bubbling around in my head.. It's a case of buckling down and doing them, and not (as is currently the case) loading up the game, and then sitting playing it for hours!!! Not sure how I missed this on release but will be getting it soon. The first two games in the series are classics and I'm really intrigued by the new level structure. Pocket Gamer gave it a really nice review and Silver rating. Keep up the good work! Wowie! 8/10 from PocketGamer. Blimey! Glad the game is being enjoyed. Keep playing, people, there's oodles more to come.